One of the approaches we use to engage your workforce is to change the way people think about work, we call this our "Philosophy Approach". We show people how they can improve their workplace and productivity. By identifying and eliminating wasteful activities they can see the advantages of adopting best practices, and the benefits for the individual and for the business. Lean thinking is the foundation from which we can build, then as confidence and understanding grows we can introduce the structured improvement tools and techniques. 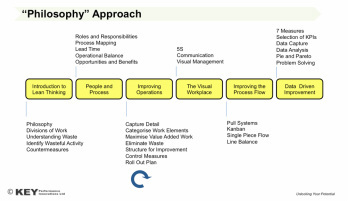 We can use this pragmatic and back to basics approach to help you introduce a lean culture into your organisation.